Cousin’s Market’s bulk department is a wonderful source for nuts, seeds, snack mixes, dried fruits, granolas, spices and much more. We believe that our snacks and snack mixes offer something for every pallet- sweet, salty, fruity, spicy and everything in between. Buying in bulk is more environmentally friendly, as it reduces the amount of packaging required to get the product to your table – no inner wraps, or printed packages that would normally require inks and dyes. Bulk nuts, fruits and snack mixes are perfect for a lunch box snack, for hiking, or just an everyday pick me up. Let Cousin’s Market cater your next corporate or private event. Contact us for details and menu. Cousin’s Market was founded on one simple idea: to bring friends, families and neighbors products they could savor and appreciate. From fresh soups to 100% fresh-pressed, not-from concentrate orange juice. The Cousin’s brand offers value to our customers without compromising the quality of taste. Each product is carefully selected and personally tested with the intent of only selecting the very best for our in-house brand. We want everything with our name on it to be as good as or better than the other items in our store. We try as many different suppliers as we can and taste countless variations and products before selecting one to tweak into perfection for our private label. We take pride in this process and enjoy working with companies with a true sense of responsibility to their people and to our planet. We guarantee you’ll find a new product to fall in love with. Looking for a unique aged Gouda to pair with your favourite wine or an everyday Swiss cheese to add to your sandwich you’ll be sure to find a memorable selection in our deli. We import quality Parmigiano Reggiano from Italy, with a selection of 100 + Domestic and Imported Cheeses are carefully selected and cut fresh daily from whole wheels and blocks, so that you are buying the best quality cheeses with the best flavors. 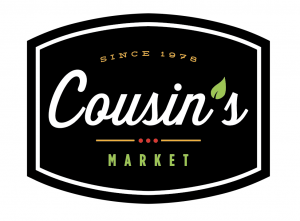 Cousin’s Market Signature Collection of Turkeys, and Roast Beefs are made in store with premium quality and contain no fillers, or by-products. Our selection of dry-cured salamis and other Italian Meats are perfect for creating an antipasto tray for any special event. Just as delicious food enhances your enjoyment in life, fresh flowers and plants can infuse your home with a touch of beauty, class and tranquility. At Cousins Gourmet Market, we bring our passion for freshness from the kitchen into the garden, with our floral department and annual garden centre. They’re always brimming with colourful flowers and hardy plants to keep your home and garden blooming all year long. At Cousins, we work hard to bring our customers the highest quality, in-season greenery we can find. Since we deal directly with local growers, our products are never warehoused, so they can often go right from the greenhouse to your home and garden within hours. Once the spring arrives, we set up a large garden centre with flowers, plants, hanging baskets, vegetable starters, potters and everything else you need to satisfy your green thumb. The moment you walk through the centre, you’ll see and feel the difference that buying local can make in quality, freshness, and variety of selection. We can also cater floral arrangements for your parties and events. Come in and one of our floral advisors can help you plan all that you need to beautify your special occasion. So, whether you want to brighten up your house in winter with a bouquet of cut flowers, or you’re ready to set your home garden blooming with beauty, come visit Cousins Gourmet Market for the freshest that local greenery can offer. Whether you’re looking for something ordinary or for something special, our shelves are lined with hundreds of options. We have all the latest and greatest gluten-free and wheat-free products, we are bringing in more and more every day. At Cousin’s we believe that our attention to detail and careful scrutiny of every product make our store exceptional. We look for the unique and premium ingredients that make food taste extraordinary. Always check back for new items! At Cousin’s Market we carry a large selection of blends and flavors. Savor the aroma and taste of the best coffees around. In our Health & Beauty department we strive to offer a wonderful selection of natural and specialty health and beauty care items. Look fresh with our range of personal care items such as soap, facial cleansers, lotions, hair care products, and lip balms. We also guarantee that our ground beef is produced fresh, in-store daily and is sold only on the day it is ground. No time to cook tonight? No problem. Whether you’re looking for a quick and convenient meal or catering an office luncheon, our broad selection of prepared foods has something for every occasion. Be sure to stop in at the hot table and choose a wide selection of roasted meats that are hot and ready to go. And, if you’re having a craving for something warm and comforting, our in house soups are made from all-natural ingredients and includes varieties from classic chicken noon soup to butternut squash & potato and leak soup. If you’re looking for lighter fare, our sushi is delivered daily. From the California roll to the extravagant assorted Nigiri, our fresh selection has something for every sushi enthusiast. At Cousin’s Market we pride ourselves in celebrating fresh food. We strive to have local, sustainable produce available to our customers throughout the year. With fresh product being brought in daily from the market, you will find only the freshest, highest quality produce each and every time you walk through our door. By partnering with local growers and providers, Cousin’s Market provides the freshest products, plus the money that is spent in our store stays here in Ontario helping build an even stronger local economy. Finally supporting local companies helps the environment, reducing emissions and saving fuel.